2.4 × 1.8 cm. Saint Petersburg, The State Hermitage MuseumInv. No. Ж 20. 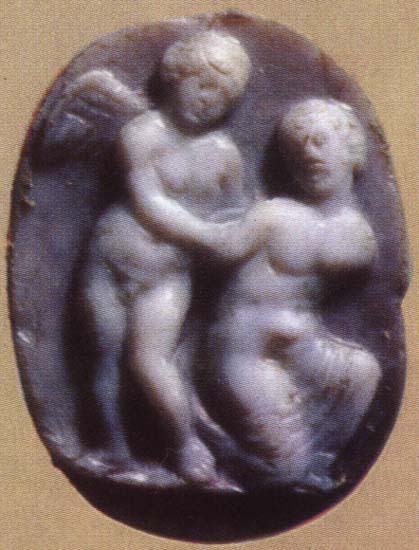 Eros tying the hands of Psyche. Acquired from the Duke of Orleans collection in 1787. OAK za 1877, str. 204; Maksimova, Reznye kamni, str. 99, — Reinach, Pierres gravées, p. 137, pl. 124. © 1971 Photo, text: Neverov O. Antique cameos in the Hermitage Collection. Aurora Art Publishers. Leningrad. 1971. P. 85, pl. 47.